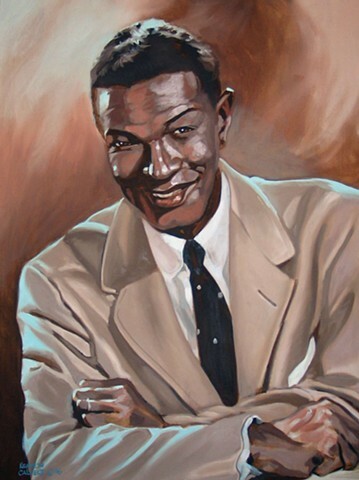 Born on March 17, 1919, in Montgomery, Alabama, Nat King Cole was an American musician who first came to prominence as a jazz pianist. He owes most of his popular musical fame to his soft baritone voice, which he used to perform in big band and jazz genres. In 1956, Cole became the first African-American performer to host a variety television series, and for many white families, he was the first black man welcomed into their living rooms each night. Cole's music has endured and he has maintained worldwide popularity since his death in 1965. His rendition of "The Christmas Song" has become a holiday classic and many of his other signature songs are frequently selected for film and television soundtracks. His daughter Natalie has also carried on the family profession, becoming a successful singer in her own right. In 1991, she helped her father achieve a posthumous hit. Natalie Cole recorded his hit "Unforgettable" and put their vocals together as a duet. Click on prints above and visit my entertainment gallery for purchasing details.